Spiders range from small, passive creatures to large, aggressive ones. They vary somewhat in appearance: from brown, black, grey, and blue spiders to spiders with red markings. They can be found in a variety of places, such as in their webs, in caves, or in the forest. The small passive ones yield Crawlers when slain. Both types may yield the Spider Eggs alchemy reagent. Crawling Chaos: Rescue the missing miners from Kulati Mines. Dangerous Webs: Rescue three Fighters Guild members from frostbite spiders. 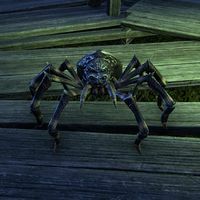 The Truth about Spiders: Figure out what is controlling the spiders in Hightide Hollow. Banespinner, found in Spider Nest. Veteran Arachnid Slayer 10 Defeat 200 Spiders in Veteran Fungal Grotto II. Veteran Selene's Spider Slayer 10 Defeat 250 Spiders in Veteran Selene's Web. Veteran Spider Slayer 10 Defeat 600 Spiders in Veteran Spindleclutch I. This page was last modified on 30 October 2018, at 17:17.